There was progress on the HP Ahoy There sailor pants this weekend, I'd say they're about halfway complete. 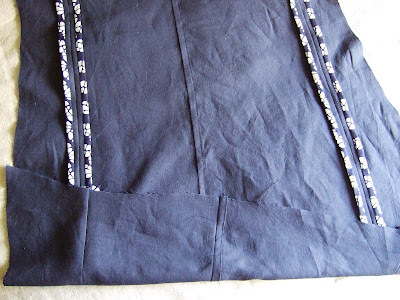 The fabric I purchased for the pants is a navy linen/something blend, I think it was linen/tencel? 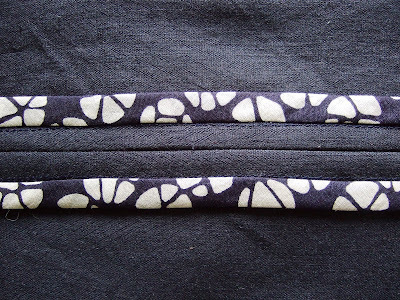 I decided I'd finish the seams and facings with a Hong Kong finish, so I rummaged around in my stash and came up with a wonderful navy & white print cotton lawn that I had leftover from a tunic top I made last year. I consulted the Pattern Review tip by Nancywin on Hong Kong seam finishes, she's also got a great slideshow to show the process. Here you can see the center and side back pieces, and the center and side front pieces, joined using the Hong Kong finish. The seam in the middle is a flat fell seam that joins the front and back legs at the inner leg seam. I am going to sew the crotch seam, baste the outer leg seams, then check the fit before actually sewing the outer leg seams. Appetite - Screenprinted bags & home accessories, kind of Scandinavian/Japanese minimal organic style prints. I really liked her napkins & dishtowels but they are not listed in her Etsy shop (currently, at least). San Diego, San Francisco, and Bristol (UK) will also be hosting Thread events this year, check it out if you are in one of those neighborhoods! Sigh. That finish is flawless. I chickened out of doing a simple french seam on a new dress and here you are flat felling and Hong Konging. Those seams look great. I'm bummed to learn that I could have been procrastinating at an textile event rather than by sorting my space! Your attention to detail is awesome. I just surge and now I feel so inadequate, haha.